When you want to have more fun in the sun, your best vehicle option is a convertible. 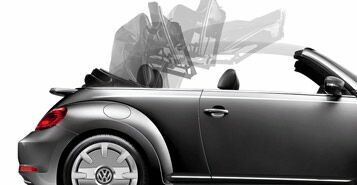 At the moment, the only open-air option in the Volkswagen lineup is the Beetle Convertible, but in our opinion, it is one of the best choices on the market. This classy convertible sports the nostalgic curves that we all know and love, but lets you enjoy the wind in your hair. 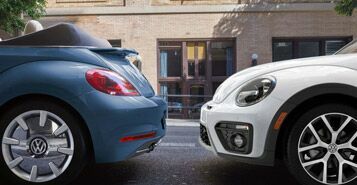 On cold or rainy days, the soft top can easily be put into place, and the Volkswagen Beetle Convertible takes on the look of a two-tone Beetle coupe. Even when the soft top is up, you can still enjoy the ride thanks to the available VW Car-Net App-Connect infotainment system, which allows you to listen to your favorite music during road trips and the daily commute. Like its coupe-styled sibling, the Volkswagen Beetle Convertible is available in a spectrum of beautiful colors. A soft top cover in an accenting color completes the look. The days of struggling to collapse or re-position a soft top are long gone! By simply pushing a button, you can enjoy the sun or protect yourself from the rain in seconds! The ultra bright headlights will allow you to see on the darkest of nights. 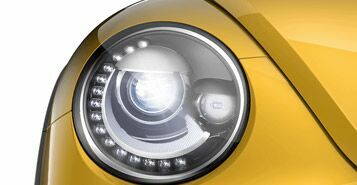 And with the LED daytime running lights, other drivers won’t miss you on dreary days.